The night before leaving on my mountain gorilla tour I met Andrew, my driver for the next five days. He was extremely nice and I liked him right away, but within a few minutes it became clear that we had a communication problem. Uganda’s official language is English and Andrew spoke the language fluently. I also happen to speak English. And yet Andrew couldn’t understand a word I said. Apparently my accent was just too different. Over the course of our five days together he never once understood me the first time I said something. “Good to meet you,” I said to Andrew when the tour agent introduced us. “It is good to meet you,” I repeated slowly. We left early the next morning in a black Toyota Land Cruiser. 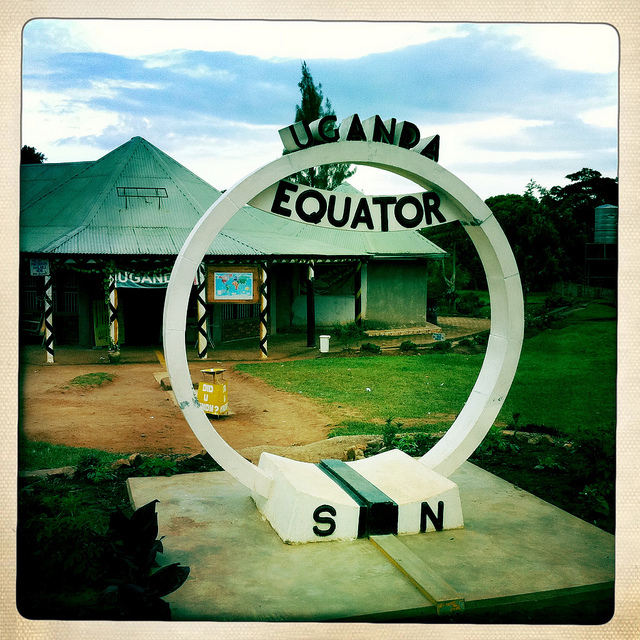 A little over an hour outside of Kampala we pulled over at a small monument marking the spot where the equator crosses the highway. It took me 10 minutes to get the basics. Andrew had been married for almost 20 years. He had four children – two daughters and two sons. We were both exhausted by the effort required to exchange so much information. Andrew looked worried that I was going to ask another question so I let him finish his lunch in silence. Although it wasn’t really silence, which introduced problem #2. My biggest pet peeve is when people smack their food. I try to tune it out but I just can’t. The sound torments me. And Andrew smacked his food. Not light, occasional smacking, but constant, enthusiastic, full-on smacking. He smacked like he was in a professional food-smacking contest and his life depended on out-smacking the competition. The fact that I was caffeine-deprived didn’t help. Sitting there at lunch I flashed forward to our next 12 meals together: we couldn’t talk because we couldn’t understand each other, and we couldn’t sit in silence because the sound of the smacking might impel me to lobotomize myself with a fork. That afternoon I confirmed the existence of a third problem: Andrew was an overly cautious driver. Don’t get me wrong – too cautious is better than too aggressive, especially considering that we often drove on rough, unpaved roads that bordered steep cliffs with potentially fatal drop-offs. But, even on flat, paved roads, Andrew drove so agonizingly slowly that everyone passed us. Matatus, trucks, buses, motorcycles – they all raced by. We did manage to pass bicycles, but it was close. About halfway to Kisoro we caught a quick view of Lake Victoria. We’d been driving just north of it for most of the day, but that was my first glimpse of the famous source of the Nile. Along the road we began to see people holding up large fish for sale, caught fresh that morning. 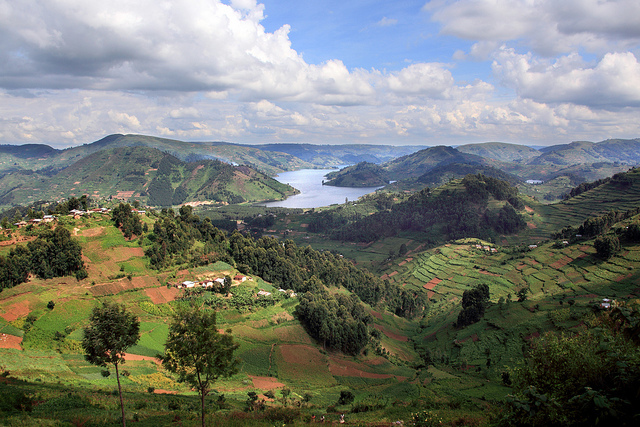 When Lake Bunyonyi came into view we stopped by the side of the road to take a look. A teenage Ugandan girl approached me and introduced herself. Most of the rural Ugandans we’d passed had given me stern, suspicious glares, so I was happy to be talking to a friendly local. I told her Uganda is a beautiful country. “You give me money?” she asked. You’d think at some point I’d learn to expect it, but I almost never do. Just before sunset we finally arrived in Kisoro, a picturesque town in the far southwest corner of the Uganda, close enough to the border with Rwanda and the Congo that I could look into both of those countries as we drove down from the hills. The Virunga volcano chain rises up just south of Kisoro, but that afternoon clouds enshrouded the upper half of Virunga’s highest volcano. My hostel was even more low-budget than I expected. I’d been told I’d at least have a “self-contained” room, meaning a room with its own bathroom, but whoever was currently in the hostel’s only self-contained room decided to stay longer, which meant I was out of luck. The room they gave me was as basic as any I’d had on the whole trip: two single mattresses on shaky wooden frames, one small window, and nothing else. The shared bathroom had a squat toilet that hadn’t been cleaned in far too long. At the hotel’s tiny restaurant that night I nursed a lukewarm Nile Special beer while dreading the arrival of Andrew’s dinner. Our food, thankfully, took a full hour, but the waitress eventually brought our plates. Andrew wasted no time hitting his smacking stride, matching if not exceeding the enthusiasm he showed at lunch. I ate quickly and retreated to my room. By 9:00 I was sound asleep. That’s how I celebrated New Year’s Eve 2010. It’s true I let minor things irritate me all day, but I genuinely enjoyed seeing the country between Kampala and Kisoro and I never lost sight of the fact that I was approaching a once-in-a-lifetime experience.